National Geographic's Trails Illustrated map of Buena Vista, Collegiate Peaks offers unparalleled detail for outdoor enthusiasts seeking to enjoy the year-round recreational opportunities available in this remarkable stretch of the Continental Divide. Created in partnership with local land management agencies, this expertly researched map features key areas of interest including Collegiate Peaks and Buffalo Peaks wilderness areas; San Isabel and Gunnison national forests; Arkansas River; Mount Harvard; and Cottonwood Pass. With miles of mapped trails including portions of the Colorado and Continental Divide trails, this map can guide you off the beaten path and back again in some of the most breathtaking scenery in the region. Cyclists will appreciate the detail paid to the many hard surface and mountain bike trails. Many recreation features are noted as well including snowmobile trails, cross country and alpine ski areas, trailheads, fishing areas, river access, campgrounds, and climbing areas. The map base includes contour lines and elevations for summits, passes and some lakes. 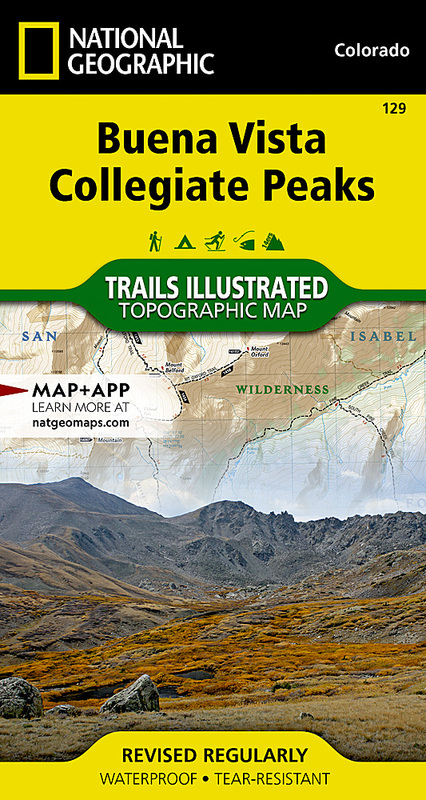 Other features found on this map include: Buffalo Peaks Wilderness, Collegiate Peaks Wilderness, Gunnison National Forest, Huron Peak, Missouri Mountain, Mount Belford, Mount Columbia, Mount Harvard, Mount Oxford, Mount Yale, Pike National Forest, San Isabel National Forest, Sawatch Range.